The Mesa Top trail is in the Grand Mesa National Forest, near the Mesa/Delta county line. Mesa Top is a semi popular trail with hikers and mountain bikers during the summer months. The trails close proximation to Highway 65 also makes it a good candidate for winter activities such as snowmobiling and snowshoeing. 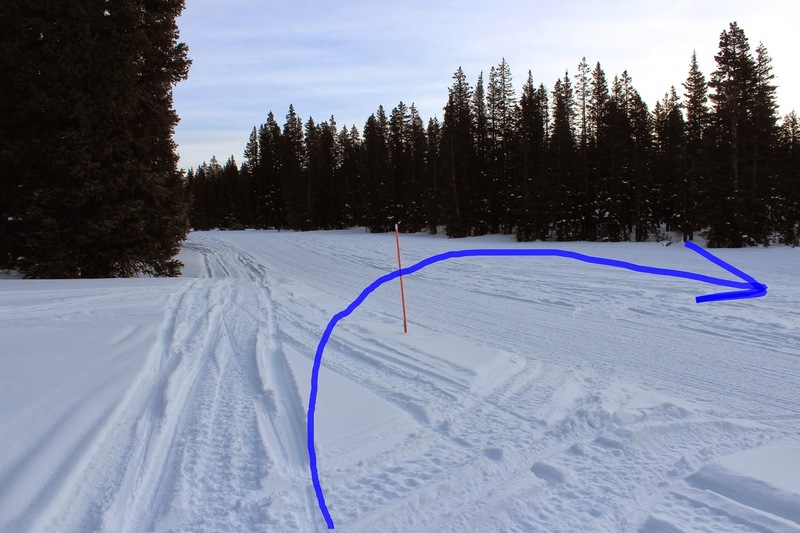 The Mesa Top trailhead is a staging area for snowmobiles during the winter months. The Forest Service maintains several restrooms with vault toilets and two changing rooms for dressing up or the occasion. The Colorado Highway Department keeps the parking area plowed so that it is open year round. A groomed snowmobile trail passes nearby to the trailhead. Snowmobiles usually take several different routes from the trailhead to the trail. The Mesa Top trail isn't marked with blue diamonds for Nordic use and the route the trail takes during the summer months isn't obvious at all. If someone wants to make sure they follow the actual trail they will need to download the GPS file so they can follow it. Since we have hiked the trail in the past we took advantage of a DeLorme feature to know which way to go. Our GPS is tied to a SPOT satellite tracker that transmits our location every 10 minutes and saves the coordinates within the GPS itself. It then displays a tracking icon for those coordinates anytime we are looking the same map. That gave us the ability to connect the the icons with the green line from our current track to follow the same course. Following that logic our previous route took us across the snowmobile trail heading to towards the southwest. 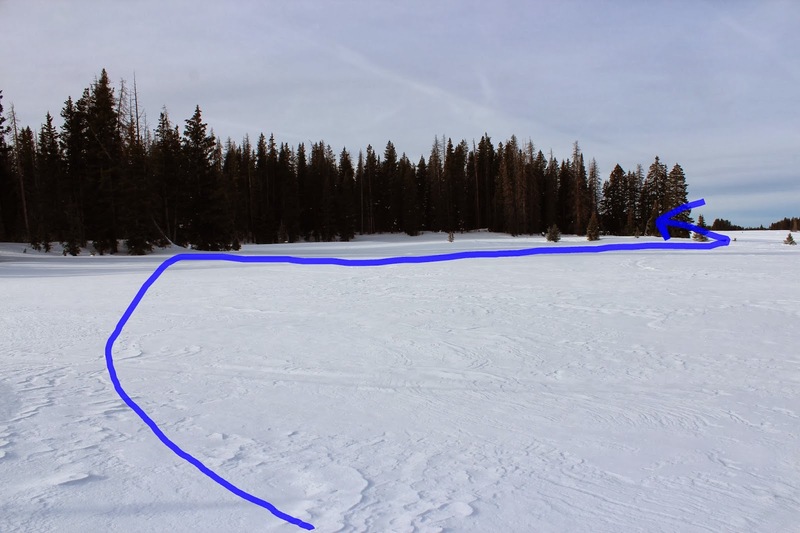 Snowmobilers had also made numerous other tracks besides the groomed trail. One of these tracks was following the Mesa Top trail almost perfectly. A person needs to be extra careful up here in the winter time. It doesn't take much of a wind to develop white out conditions in these open areas. It really pays to have an GPS with extra batteries and a few emergency supplies like a fire starter when venturing very far from the trailhead. It has only been a couple of years since we hiked this trail in the summer time so the general route was still fresh in our memory. We turned around in a shallow arroyo near a rock outcrop where we had seen signs of a mountain lion on a previous trip. We were captivated by a couple of trees that were only about 6-8 feet tall yet they were seemingly covered with as many pine cones as the 100 foot tall trees. The also had a sparkling layer of hoar frost that beckoned to be photographed. The nice advantage of snowshoeing is that you can do it pretty much anywhere you can find deep enough snow and a place to park. We didn't need to stay on any particular trail. We were doing that mainly for the challenge. 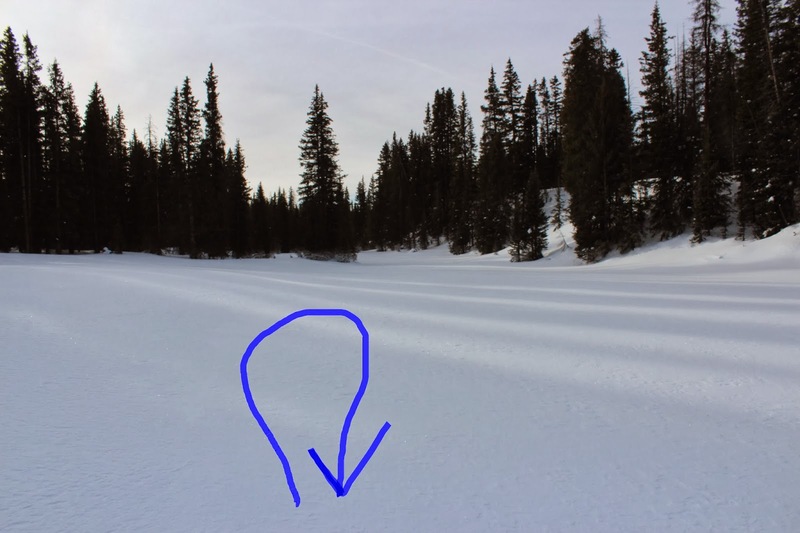 We had seen fresh moose tracks crossing the highway about 100 yards east of the Mesa Top trailhead. We were almost tempted to snowshoe in that direction to check them out. At least once a year they hold sled dog races at Mesa Top that are fun for the general public to watch. If you would like to see it for yourself then all you have to do is 'Take a hike'.